Winnipeg candidate for mayor Gord Steeves made one of the biggest splashes last week in what has been a pretty dull race so far. On Friday, July 25, Steeves announced a $100 million road and infrastructure fund, with the money coming from the sale and redevelopment of underused city golf courses. Thus the dormant city golf course debate has been unexpectedly reopened. Revenue for this fund will be created through the divestment and redevelopment of four underused City of Winnipeg golf courses including Crescent Drive, Kildonan Park, Windsor Park and John Blumberg golf courses. This redevelopment plan will be specifically sensitive to the areas in which they exist and will actually create a net gain of 60 acres of free, public green space for Winnipeg residents. Through the divestment and redevelopment of these assets, The City of Winnipeg would immediately generate approximately $100 million specifically for road and infrastructure repairs, alongside ongoing newly generated TIF revenue. Foregoing $3 million in required upgrades. At the time the Golf Convergence Inc report was published, both the neglected Windsor Park and Kildonan Park courses required $1.5 million in remedial investment to restore the condition of the courses to where they should be. Some of that investment may have already been made in the past two years (or perhaps the deferred capital requirements have grown since then), but redeveloping the courses would remove the necessity to reinvest in the courses and incur these costs. Relief from ongoing losses from the operation of the golf courses. Winnipeg Golf Services has been bleeding between $750,000 and $1.2 million for years. Despite some optimistic projections to the contrary, there is no end in sight to these losses. While the course by course breakdown of those losses is not public knowledge as far as I know, whatever portion of those losses that can be attributed to Crescent Drive, Kildonan Park, Windsor Park and John Blumberg would be money in the bank, year after year. Opportunity for infill development. This is an important one. A city has to grow; and it can grow out or it can grow in. Growing out is easier, with fewer NIMBY neighbours and upset special interest groups to oppose the development, but it is also worse for the city because it strains city services and infrastructure budgets and leads to a less dense and dynamic urban environment. Opening up areas within the city creates opportunities for growing the city while leveraging existing infrastructure and adding to the density and sustainability of the city. Tax revenues from new development. The Steeves announcement refers to “newly generated TIF revenue”. You could call it that, or you could just call it increased property tax revenue. More useable public recreation areas. Golf courses are businesses. You have to pay to use them. Redeveloping golf courses can result in more free green space that is usable by the public. The negatives to selling golf courses include the obvious: less choice in recreational golf in the Winnipeg area, and the loss of the visual appeal of golf courses. I won’t get into whether the pros outweigh the cons here, and that comparison may vary from course to course. Not all golf courses are equal. Instead what I’ll do here is look at the redevelopment potential of each course, with the help of work that was done on the now-dormant Anybody Want A Peanut blog (Posts ONE, TWO, THREE & FOUR). Crescent Drive: A Nordic spa is being built here, using the golf course as an anchor. The city is subsidizing an amenity that benefits a private enterprise. It benefits citizens too, but let’s be honest: it’s a pretty crappy course and it’s difficult to justify maintaining it on its own merits. There is not a whole lot of development potential here, but every effort should be made to sell the course to the owners of the spa. Kildonan Park: There is a unique opportunity here to expand Kildonan Park (the actual park) by redeveloping Kildonan Park, the golf course. 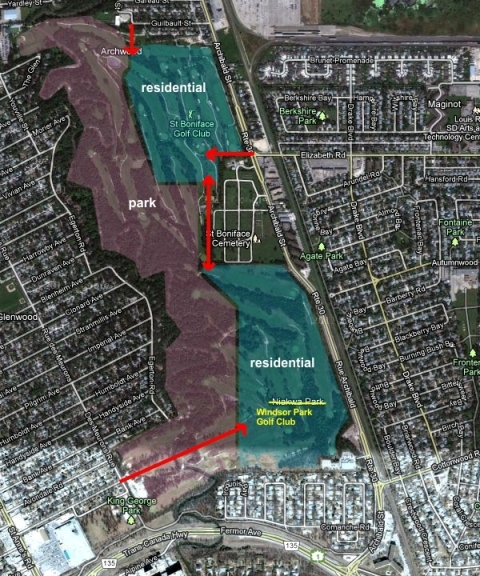 The escarpment that runs through the course would make a natural dividing line between what could a very attractive residential development, and the park and river frontage below. The development of this area would require the addition of traffic lights at Templeton Ave, but it would be relatively straight-forward. Meanwhile the expanded park would extend public access to the river. It could also include that off-leash dog park that everyone seems to want. This one looks promising. Windsor Park: The Windsor Park golf course would be more difficult to develop because the access points are not good. Bordered by the Seine River on the west, Archibald and the CP Emerson line to the east, the St Boniface Golf Course and cemetery to the north, and a quiet residential neighbourhood to the south, there are no major intersections to build off of and no good way to get traffic in and out. It might be possible to get in across the river from St. Anne’s to the west, and to put up another traffic light on Archibald from the east, but it’s a clumsy arrangement. A more compelling idea is to combine Windsor Park with the city-owned St. Boniface course. Access points would improve, and a new linear park could be developed along the river. The winter ski trails, which are as much of an attraction here as the course itself, could be expanded, and a better north-south active transportation corridor could be built. Alternatively, the two golf courses could be combined into one better public course, as suggested by the Golf Convergence report, and any remaining space could be sold off for development. John Blumberg: I do not like the idea of developing the John Blumberg golf course. (It is actually two courses: a 9 hole and an 18 hole layout). This is not an “infill” area, thus benefit #3 listed above would not apply. It is also a decent golf course with the potential of becoming a very good golf course in the right hands and with the right investment. The city should look at selling this facility, but only to a golf course management company that has the ability to reinvest in the course. Ideally, it would be redesigned as a single 18 hole championship layout. I would love to see that. I am looking forward to seeing the details of Gord Steeves’ plan. Selling and redeveloping any golf course will be a contentious and messy affair, but if done right could, in some cases, result in important benefits for the city. Unfortunately, your map of the Windsor Park gold course is quite inaccurate. The Windsor Park GOld Course (which you have labelled incorrectly as the Kildonan Park Gold Course) only extends as far north as the southern boundary of the cemetery.Everything north of that is the privately-owned St. Boniface Golf Course. *golf, not gold. Of course. 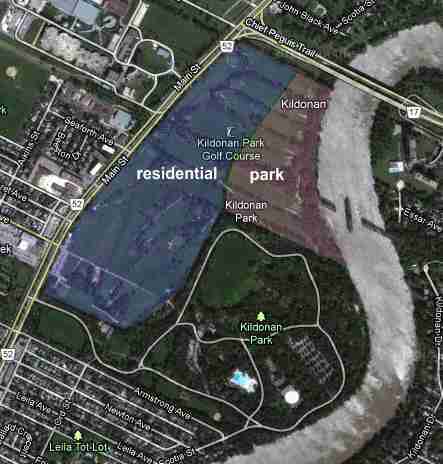 I have reposted and corrected the labeling of Windsor Park. You can’t trust the stuff you find on Anybody Want A Peanut I tell ya. It was labelled in the first place to correct Google maps which called the golf course Niakwa Park. The map includes St Boniface intentionally, because it shows potential access points for a combined development. As much as I love golfing, and I golf these courses quite often, I won’t cry if they are sold off. There are about 25 golf courses in Winnipeg, and many more in the surrounding area, so losing two to three will not have major implications. Golf courses need to be maintained and upgraded every once in a hundred years, and these have not been. Pro shops need to sell merhandise, and run a restaurant and bar to be profitable. Any private course knows that green fees need to increase over time and employee wages can’t be out of control if they plan to run a successful business. If the city is unwilling or unable to change its golf services then it will fail… And it has.